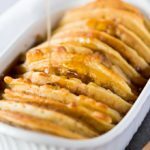 Turn waffles into a waffle French toast casserole with this simple recipe! After soaking overnight, it's ready for baking in the morning. I have seen the future, and it is covered in maple syrup. There's waffles. There's French toast. And then, appearing in a glitter of sparks as if beamed down from a space ship, there's Waffle French Toast Casserole. Yes, the invention we've all been waiting for—I'm still waiting on the flying car, but I digress—is finally here, and breakfast will never be the same. You take some waffles. Homemade, toaster-ready; it doesn't matter. 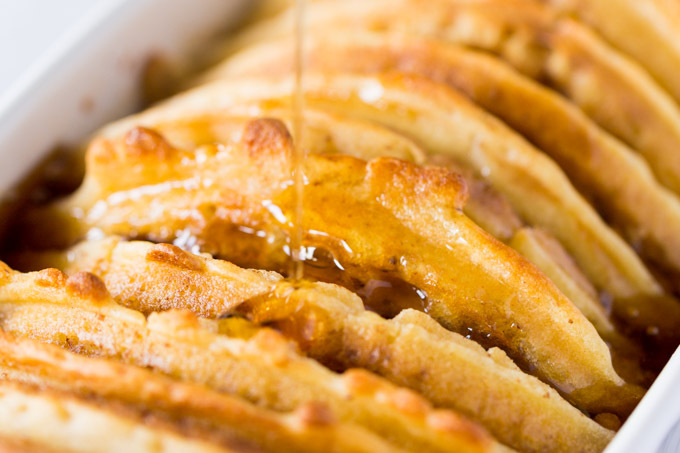 Just get your hands on some waffles and soak them (the waffles, not your hands) overnight in a simple mixture of eggs, milk, vanilla, and cinnamon. While you're at it, you can make your coffee ahead of time, too. What? Have I blown your mind? Fear not. It's all under control. 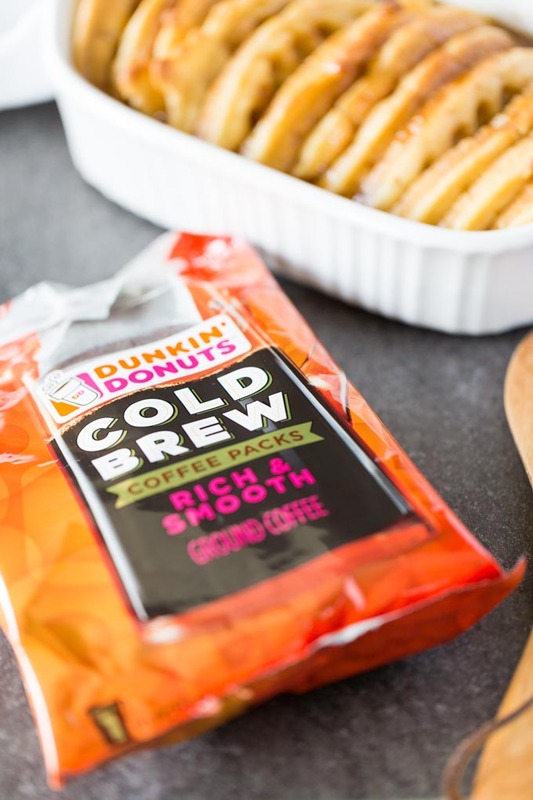 All you need is some Dunkin' Donuts Cold Brew coffee packs from Target. 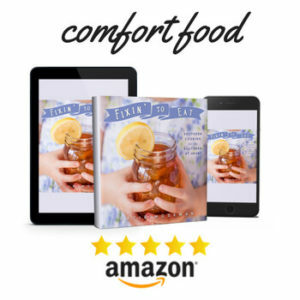 I picked mine up when I went shopping for the overnight waffle French toast casserole ingredients. You can find it in Target's coffee aisle and use this Cartwheel offer to save (30%!) 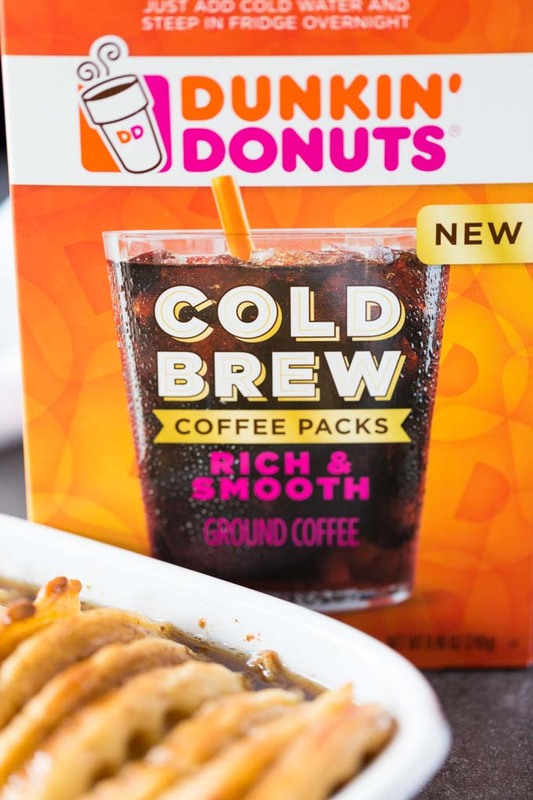 on your purchase of the Dunkin' Donuts cold brew packs. What is cold brew, anyway? I'm glad you asked. It's a coffee brewing method in which ground coffee is steeped in cold water for 8 to 12 hours. Cold brew coffee is rich and smooth, with less bitterness and acidity than coffee brewed with hot water. 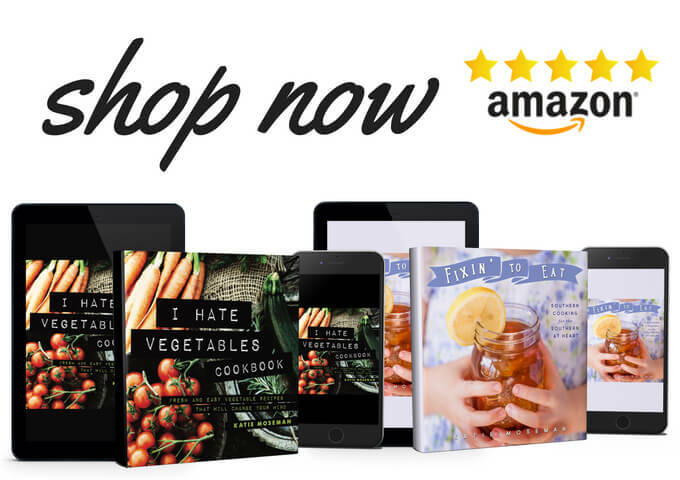 It's amazing how easy it is to make. 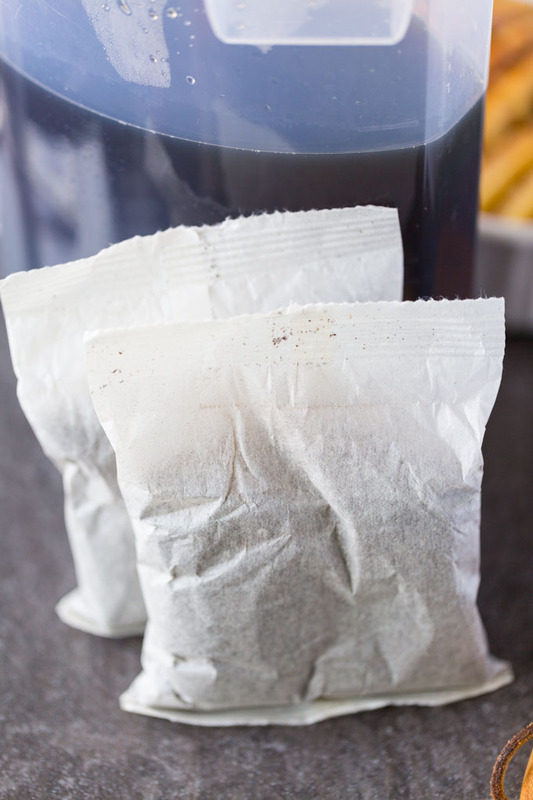 Just put two Coffee Filter packs in a pitcher, add 4 cups of water, steep it for 8 to 12 hours, then remove the filters and add 3 more cups of water (adjust to taste). You can serve cold brew coffee at whatever temperature you prefer. Warm it for a traditional cup, or pour it over ice for iced coffee. Either way, it pairs perfectly with Overnight Waffle French Toast Casserole. My favorite thing about this breakfast casserole is that the top edges of the waffles get all golden brown and crispy, while the bottom edges get all soft and bread pudding-like. Combine eggs, milk, sugar, vanilla, and cinnamon in a mixing bowl. Whisk until the sugar is dissolved. Cut the waffles in half, like half moons. Submerge each piece in the liquid, let it soak for a few seconds, then place it cut edge down in a 1 quart casserole dish. Continue until the dish is full (snug but not overstuffed). Pour remaining liquid evenly over the top of the waffles. Cover lightly with foil and refrigerate overnight. Preheat the oven to 400 F. Bake the casserole for 15 minutes, then turn the oven down to 300 F and bake another 15 minutes. If the top begins to get too brown, tent loosely with aluminum foil. Remove from oven and let cool slightly. 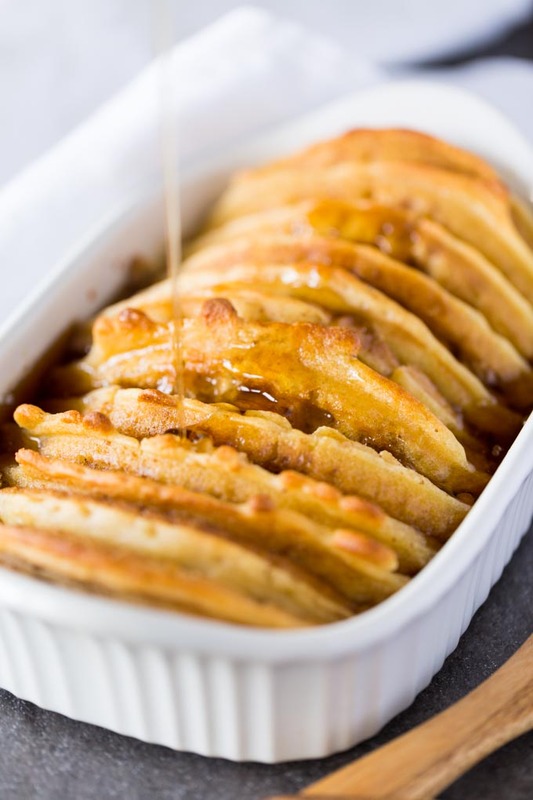 Serve with maple syrup, or drizzle 1/4 cup of maple syrup over the whole casserole before serving (your choice). 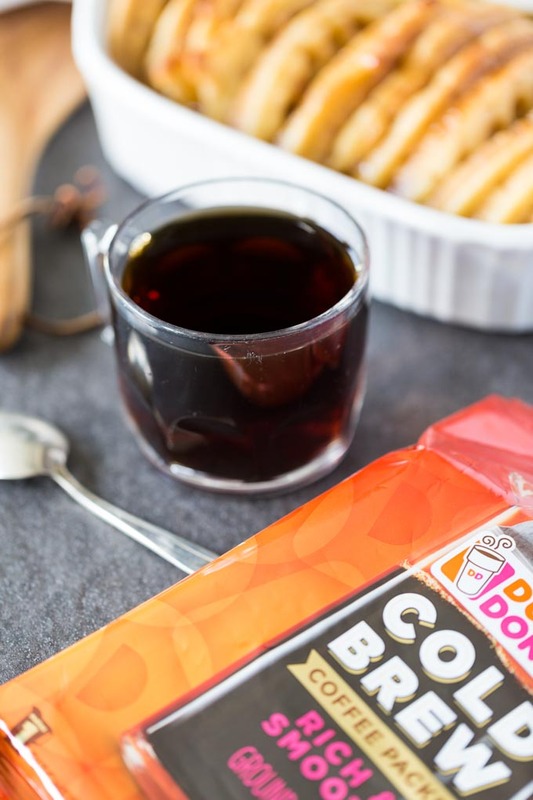 Don't forget to save on Dunkin' Donuts Cold Brew at Target with this Cartwheel offer! I made this with gluten free waffles and it turned out great! Thank you! 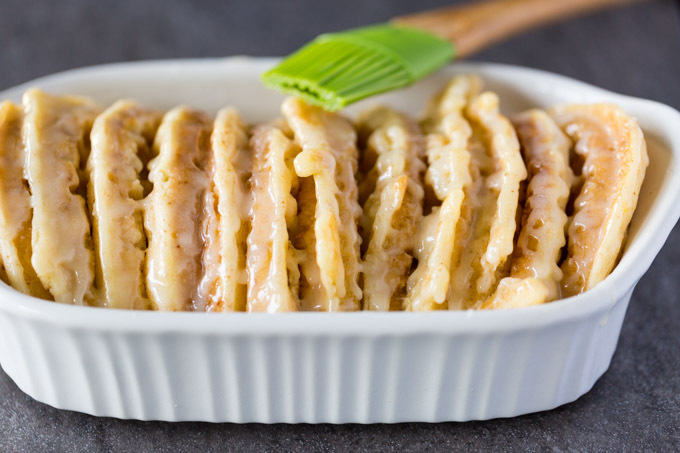 I love your idea for this casserole, however, I’m pretty sure your nutrition counter is way off, at least for carbohydrates, since one waffle alone is at least 15 carbs, but once you add the sugar, that goes way up. 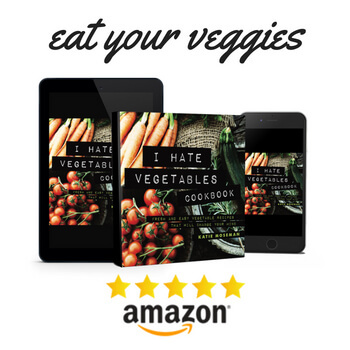 Thank you for this amazing recipe. Hmm… I think you’re right! I re-ran the nutrition calculator, and it came up with the same numbers, but when I looked at my box of waffles I could see that the carbs plus the granulated sugar would add up to more than shown in the original calculation. I’m editing the nutrition info right now to reflect a more accurate approximation. Would this turn out if you don’t soak it over night? I prefer to soak it overnight, but it will work quite well if you let it soak for about 15 minutes to allow the waffles to soak up as much liquid as possible.